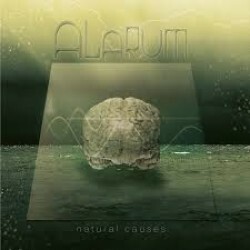 This review may be more than a little late, being that Australian progressive metallers Alarum released this metal opus Natural Causes back in late 2011, but better late than never right? If you know anything of Alarum though, you know they don’t do anything in halves, sometimes leaving up to five years between releases. Listening to Natural Causes in its entirety, it’s easy to see why, as each song incorporates a whole host of different musical styles and a plethora of riffs to digest. Kick starting the album is the title track, which begins with a short piano piece, before launching in to some sharp riffing and a flurry of double kick action, for which is accompanied by Mark Palfreyman’s distinct vocals. The lead guitar department is at its most impressive on this track with jazz flavoured leads pulled off with seemingly almost effortless ease. ‘Shifting Skies Like Nothing’ continues where the title track ‘Natural Causes’ left off, mixing killer angular thrash riffing with jazz soaked sections and even a hint of the middle east in the lead guitar licks around the middle section of the song. ‘New Creation’ is a clear stand out track, with a catchy as hell hook to it, and some seriously killer leads. ‘Evspanol’ is a quite left of field track, featuring 58 seconds of classical Spanish inspired acoustic guitar, which segways rather nicely in to the track ‘Non Linear Parrallels’ which boosts the tempo up a notch or two and features a seriously funky cowbell dominated drum beat around the mid section of the song also. ‘Silent Betrayal’ continues to kick things up gear with its thrashy pace and is another standout track on the album. Older fans will be able to rejoice in the fact that the narrative started on previous album returns again in the form of ‘Boundless Intent Part 3’. The instrumental track ‘Sensorary Endeavor’ is also a fun track, which is taken in many different directions and really highlights how technically proficient the band is. A lot has been mentioned about the lead guitar in this review, and with good cause. There is plenty to rant and rave about in that department. The true gel for this band comes in the form of the drummer Rob Brens though. All throughout the album, Rob continually impresses by seamlessly transitioning the band through the varying different styles and time signatures, there is plenty of interesting beats and drum fills also, without sacrificing the flow of the songs. There is no doubting Alarum’s technical prowess, as each and every member is clearly very proficient with their instruments. At some points during the album though, it does feel that they may be doing a little too much. Song writing at times does feel like it takes a back seat to individual parts, riffs and sections of individual songs at times, which can upset the overall flow of the album. I do hear that they are working on new material for a follow up now however. While it may be exciting to see where this talented bunch of musicians go next, don’t hold your breath on it being released anytime soon, if their previous track record is anything to go by.